These settings are so advanced that there are no checkboxes for them! Actually, they should be used only in very rare and specific cases, and most users should not be changing them. To use these options, you must add/edit certain lines in your layout configuration file. Open SaT, and click on the "File" menu in the upper left, and then "Current layout". This will open your layout file. All of these extra advanced options will need to be added under the [settings] heading, which you should see at the top. You will add the setting by typing the setting name, then an = sign, then the value, with no spaces. Leave all the other settings in tact. If you have already added the setting in the past, search for it in the file, then just change the value to the right of the = sign. You could add the option anywhere under the [settings] heading, but its easiest to just add it to the very top, directly underneath the heading itself, so that you can find it easily in the future. Keep in mind that there are other headings such as [general] and [sites] and [hotkeys] and you do not want to put the setting line under those. After adding the line to the config file, you must SAVE the file, and then close and reopen SaT. 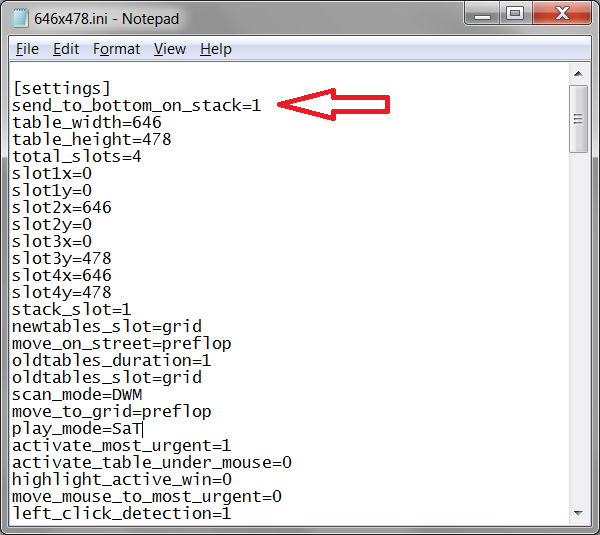 Whenever SaT moves a table back to the stack, either via a "Stack" hotkey, or clicking on the Fold button, it can also move the table to the bottom. Set this to 1 if you want the table to move to the bottom. By default, this is off, and the table will move back to the top of the stack. This option controls whether or not SaT will keep the tables snapped in their grid slots. By default, this is turned on, so if you drag a table that is in grid and try to move it somewhere else on your screen, SaT will snap it back into place. Set this to 0 to turn it off. If you turn it off and drag a table, you need to realize that SaT will still think the table is in its grid slot, so just because you move it somewhere else, it is still considered to be "tiled" and "in grid". Whenever SaT detects a New Table, this setting will send that table to the bottom. Usually this will only be useful if you use a specific slot for New Tables where they would be stacked on top of each other. When using the "Stack table at End of Hand" feature, SaT will send the table back to the stack when it detects that the hand is finished. However, it is useful to have a brief delay before re-stacking the table, so that you can watch the showdown and see the other players cards. This setting is the number of milliseconds to pause after detecting the End of the Hand, and before sending the table back to the stack. For example, if you would like a 3 second delay, you would use: end_of_hand_restack_delay=3000. You can also set it to 0 for no delay. After you use an action button hotkey such as fold/call/bet, or after you click on one of those buttons with your mouse, SaT will pause for a brief delay, which is determined by this setting. SaT pauses because some poker sites are slow to update and redraw their table. For example, suppose you use the Fold hotkey in SaT on a poker table. SaT will click the Fold button. But if the poker site is slow, it will take a split second for the Fold click to register, before the site will actually fold your hand and update the graphics, then remove your cards, and remove all the action buttons from the table. If you notice that when you press the Fold+Stack hotkey, the table pops instantly back into grid, it could be because the site is simply slow to register the Fold click, and therefore SaT still sees the Fold button visible and thinks the table still needs action. Most likely, you will only be INCREASING this value higher than the default of 150. The side effect of increasing this would be that SaT will feel slightly slower when using those hotkeys. When you press the 'Ignore Table' hotkey in SaT, the table will be excluded from SaT detection, and moved to the center of the screen. To change the location where those tables are moved, you would use these two settings to specify the x/y coordinates of your full screen. By default, when SaT finds a New Table, it will try to restore the table from a minimized state, and then activate that table and give it focus. Setting this to 0 will cause SaT to not activate the table. Keep in mind that Windows will likely Activate/Focus the table anyway if the table window was just newly created by the poker site. Note: if you set this to 0, sometimes FullTilt and Party tables will open up minimized. The size of the border to draw around the table when the setting for "Highlight active window" is turned on. The color of the border to draw around the table when the setting for "Highlight active window" is turned on. The color code must be in RGB hex format. See this chart for examples. This setting determines whether the border highlight is drawn "inside" the boundary of the window or not. You may need to turn this off (0) if you are having problems with SaT going into a resizing loop. If you use the 'Move Mouse to Active Table' feature, then the mouse will move to 2/3 (0.66) of the width and 2/3 (0.66) of the height of the table, placing the mouse cursor near the fold/call/bet buttons. If you would like to change this position for the mouse to move, you would need to add these lines to your config file. The setting is actually a decimal fraction (not a percentage), and the correct allowable values are between 0 and 1. For example, if you want to move the table to the exact center of the table, you would use move_mouse_x_percentage=0.50 and then the same for the y-percentage setting. These settings are for the Increase/Decrease bet hotkeys. They determine what size the to increase or decrease the betbox with each hotkey press. You can choose either "sb" which would increase the bet by a small blind size, or "bb" for big blind size. In v2.57, "halfsb" was added, which means half of the small blind size. To change the setting, add the line but do not use the quote marks around the "sb" or "bb" value. Example: increase_bet_increment=sb. In v2.82, you can now set this to any number, which would be a multiple of the big blind size. For example, this increase_bet_increment=0.5 would be the same as "sb". Similarly, "0.25" would be the same as "halfsb". And "2" would make each increment 2x the bb size. Note, these settings won't work for all sites (BovadaBodog, iPokerNew, Winamax). By default, this is turned on, which means that for these sites only (FullTiltPoker, PartyPokerModern, and BovadaBodog) using the Increase/Decrease bet hotkeys will click the +/- buttons on the table when the hotkey is pressed. If you change this to 0, then those buttons on the table will not be pressed, and instead, SaT will attempt to do the math and calculate the appropriate increment as defined by the above setting, and then attempt to put that amount into the betbox. SaT has some BetSize hotkeys which will click the preset bet buttons on the table. There is an Advanced Option to also click "Bet" after using those hotkeys, so you can bet with one hotkey press instead of having also send a "Bet" hotkey as well. If you use that Advanced Option, then by default, SaT will wait 300 milliseconds before clicking the "Bet" button. This allows the pokersite time to update the betbox with the bet amount. If this value is too low, then SaT may click the "Bet" button before the pokersite has registered the BetSize click, and then you will end up minraising instead. If you notice that problem, then you may want to increase this value. This setting only affects the specific case when you try to use your 'Fold' hotkey when you can check for free. On these specific sites: PokerStars, FullTilt, WinningPoker, BovadaBodog, Winamax, they don't allow you to fold when you can check for free. They literally REMOVE the Fold button so there is no option to open fold your hand. So when this happens, SaT will try to click the Check button for you instead, so you can check for free, without having to use your 'Call' hotkey (which clicks the middle button which is either "Check" or "Call"). However, in case there is an error, SaT will still try to click the Fold button coordinate in case there was an error, just to be safe. We don't want to mistakenly call a bet when we press the 'Fold' hotkey. So SaT will first try to click Fold, and then wait. SaT will wait according to this setting, which by default is 600ms (0.6s). If SaT still sees the buttons as visible (meaning the Fold click didn't work), then it will try to click the Check button. You may notice that your Fold hotkey feels slow in this instance when you can check for free. Thats because SaT is delaying. You can speed things up by lowering this value below 600ms. It is recommended that you don't touch this setting, because the delay in there for a reason. If you change this, and your Fold hotkey starts calling bets, don't say that you weren't warned. When you use a "Keep Table in Grid" hotkey, the table is 'locked' into its grid slot, and will not respond to any stacking commands. It also will not respond to 1. any "Move Table" hotkeys or 2. Dragging/Dropping to move the table, effectively preventing the table from moving into other grid slots. If you turn this setting on, then the both of those 2 moving features will work, and the tables will be able to move around the grid. But 'stacking' commands will still fail. It is recommended to leave this setting turned off. If you want to move a table that is already 'kept in grid', you should first toggle off the "Keep in Grid" state, move/drag the table, and then toggle it back on. When you use a "Keep Table in Grid" hotkey, the table is 'locked' into its grid slot, and will not respond to any stacking commands. It also will not respond to any Dragging/Dropping to move the table, effectively preventing the table from moving into other grid slots. If you turn this setting on, then you will be able to move the table around the grid by dragging and dropping the table into other slots. But 'stacking' commands will still fail. When you use a "Keep Table in Grid" hotkey, the table is 'locked' into its grid slot, and will not respond to any stacking commands. It also will not respond to any "Move Table" hotkeys (or "Re-fill grid"), preventing the table from moving into other grid slots. If you turn this setting on, then you will be able to move the table around the grid by using any of the "Move Table" hotkeys. But 'stacking' commands will still fail. The recommended and default setting for New Tables is to move them to the 'grid'. If your grid is full and there are no more available slots, then by default, SaT will leave the table wherever the pokersite opens it, which allows you to take your seat and buy in. If you turn this setting to 1, then when your grid is full, SaT will move the table to the stack instead of leaving it where it is. This setting is the time to delay after each Increase or Decrease Bet hotkey is finished. This is necessary because many people set their Increase/Decrease Bet hotkeys to map to their scroll WheelUp/WheelDown mouse buttons. This can cause a problem, because when you scroll really fast, Windows receives many scroll messages very fast in succession. SaT needs time to read the blindlevel and current betsize, increment the value, and send the new betsize to the betbox. However, if the pokersite is slow to respond to the new input that is being sent to the betbox, then the betbox will not update in time before our next scroll message fires off, causing SaT to incorrectly read what the new betbox value is. If you notice during fast scrolls that the IncreaseBet hotkey fails and starts incorrectly inputting all-in sized bets, then you probably want to increase the value of this setting. Try going up and using 100 or 150 and see if that helps. When turned on, this setting will cause a random number to be displayed in the table count popup. The random number updates every 2 seconds. SaT determines when it is your turn to act by looking for the visibility of the Fold button. When you Include a site, SaT saves the color of the Fold button, and then checks for that color while the program is running. By default, SaT allows for variance when looking for the color, because on most poker sites, when you hover your mouse over the button, the button changes color slightly to indicate that your mouse is over it. So a "red" might change to a "light red" when you hover your mouse over the button. But, a problem can sometimes arise. Suppose the table background color is also a shade of red. Of course it probably won't be exactly the same red as the Fold button. But SaT allows for some difference. Now, even when the Fold button isn't visible, SaT will still see "red" and think the Fold button is visible. In this case, this typical troubleshooting test will fail, and the tables will never go back to the stack and stay there. This setting controls the amount of shades of variation to allow. Usually if you are seeing the problem described, then you will want to add this line and try some smaller numbers. Try color_variation=16 and if it still fails, then go down to "8", etc. You probably don't want it at "0"
The "Re-fill Grid Tables" hotkey will remove all of the gaps in your grid, making it look orderly again. By default, that hotkey will attempt to move as few tables as possible. Suppose you have 4 total slots, with slot 1 being your stack slot. If you have tables in slots 3 and 4, then slot 2 is open and creating a gap. So using that hotkey will cause the table in slot 4 to move to slot 2, leaving your grid slots 1,2,3 all filled in order with no more gap. The table in slot 3 stayed in place because SaT didn't need to move it in order to have the grid slots full in order. Some people would prefer that the tables retain their order in the grid. This setting handles that. So if you turn this option on ("1"), then in the same example above, first the table in slot 3 would move to slot 2, and then the table in slot 4 would move to slot 3.